With 25 years of experience, Spain has the largest High Speed Railway (HSR) network in Europe. Taking advantage of this experience, a Spanish consortium was awarded a €6.7 billion contract to construct, operate and maintain the second phase of the Haramain HSR line in Saudi Arabia, as well as the supply of trains and their maintenance for a period of 12 years. 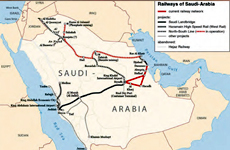 For the transport and geographic characteristics of Saudi Arabia, the Spanish HSR is a good example to look at. A comparison of the main topics that can influence HSR development and demand is done including geography, economy, institutional and legal framework and transport characteristics. Even though this kind of comparison was difficult due to a different culture and the development of the country some lessons can be learned. First, the know-how gained by construction firms and the infrastructure manager has helped drive down costs and is the key to overcoming the challenge of HSR under extreme climate circumstances. Second, although HSR demand mostly relies on the evolution of national income and the transport system competing with train, Train Operating Companies have control over influencing variables (such as commercial speed, prices or frequencies) and therefore must have freedom to adapt their strategy to increase demand and revenues. Third, there are difficulties to predict demand and although rapid traffic growth can be expected it seems doubtful the Haramain HSR line will reach 60 million users per annum in 12 years. Finally, due to the high risks involved in the project a greater understanding by the parties of each other’s’ position is crucial to its success: Saudi Arabia will gain expertise in the development and operation of HSR and will be able to attract international funding in the future, whereas Spanish companies will benefit by improving their technology and the possibility of exporting its know-how to other countries.